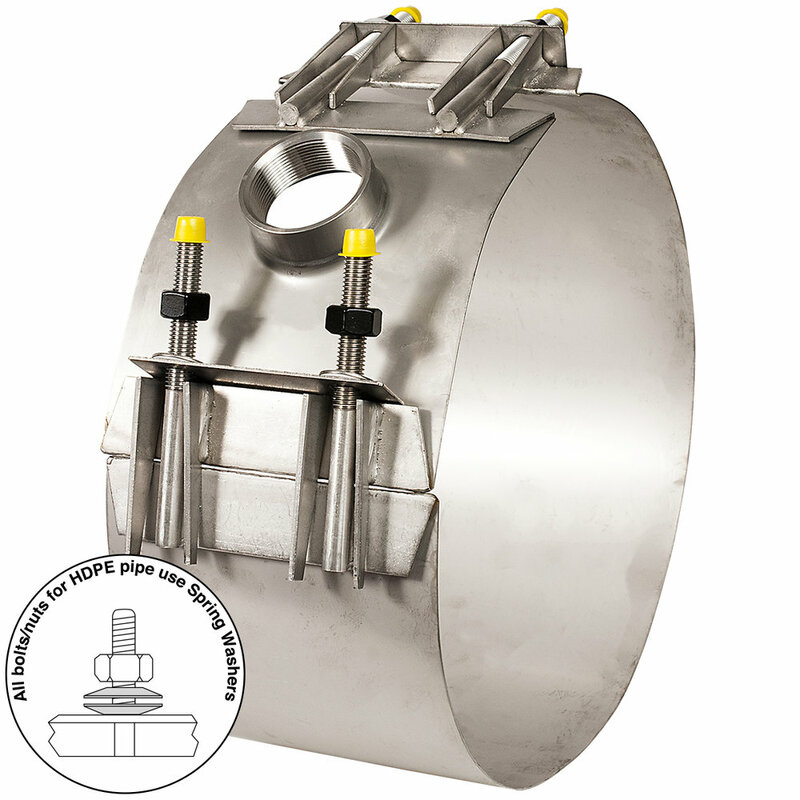 Full circumferential seal, stainless steel tapping sleeve with side lifter bars. Available with ductile iron or stainless steel flange. SST-H tapping sleeves use spring washers to help compensate for pipe contraction during temperature and pressure changes. OUTLET SIZES 3" - 10"
COMPATIBILITY For use on HDPE pipe with a minimum wall thickness of SDR17. FLANGE Ductile (nodular) iron, meets or exceeds ASTM A536, Grade 65-45-12. 304 Stainless Steel optional. All flanges in accordance with ANSI class 150 drilling and recessed to accept tapping valve. STAINLESS STEEL Meets or exceeds ASTM A 40-92c type 304 UNS designated S30400. OUTLET Heavy gauge 304L Stainless Steel. Fused to shell by GMAW welding. NUTS Heavy hex, 304 Stainless Steel, 4 inch nominal size sleeves uses 1/2" UNC threads, 6 inch nominal size and larger sleeves uses 5/8" UNC thread. Nuts coated to prevent galling. WASHERS 1/2” or 5/8" 304 Stainless Steel spring washers manufactured from a special grade of Stainless Steel used in the making of springs. 1/2" or 5/8" Plastic washer prevents galling between nut or stainless steel washer and lifter bar on all sizes. GASKETS Virgin SBR rubber compounded for water and sewer service in accordance with ASTM D 2000 MAA 610. Specially designed grid pattern and tapered ends to assure seal around full circumference of pipe. Reinforced ring at outlet provides hydrodynamic seal. Other compounds available for petroleum or high temperature service, or other special applications.